This time I use Quay Po house custard cream filling. It is really great! Instead of using only yolks this recipe calls for whole egg. Some flour is added to thicken the cream. Therefore this custard cream is a lot easy to prepare. Some orange rind is added to give fresh aroma to this custard cream. Due to less yolk (eggs) and present of orange rinds produce custard cream with less no eggy smell. For those who dislike eggy smell in custard cream this one sure you need to try. 1. Whisk yolks and castor sugar till well combine. Add in oil, milk and vanilla extract. Mix well. 2. Add in the sifted flour and whisk to combine. 3. In other bowl beat the whites till foamy. Add in 1/2 the castor sugar and vinegar. Continue beat till glossy. Add in the rest of castor sugar and beat till soft peak. 4. Spoon 1/3 of the stiff whites into yolks batter. Fold to combine. Pour the yolk mixture into the remaining whites bowl. Fold till well combine. 5. Scoop batter into paper liners to slightly more than 3/4 cup full. Bake in preheated oven 170C for about 22 - 25 minutes (depending on the size). 6. When done, remove from the baking tray and cool it on rack. 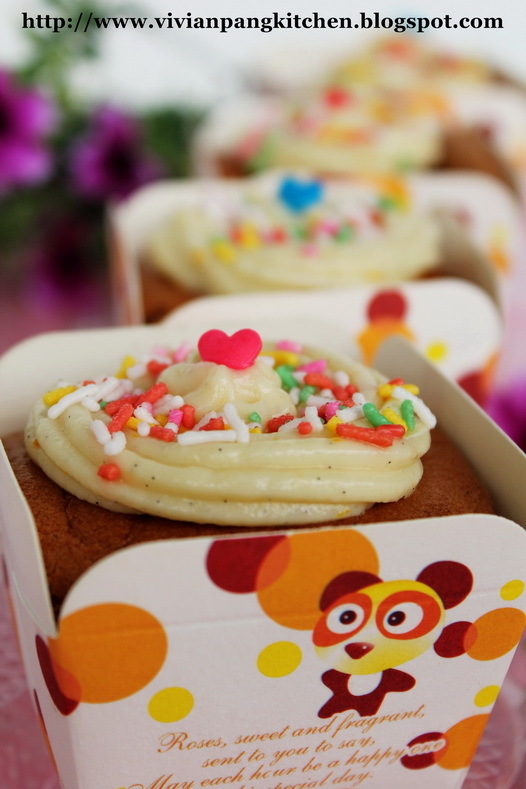 *the cake will shrink a bit after being remove from the oven. I used to prepare custard cream after finish baking. However you can always cook in advance and keep the cream in fridge to set before used. 1. Scrape the vanilla seeds from the pod and set aside. Throw the pods into the milk and cook in a bain-marie till you see a light froth around the edges of the pan, where tiny bubbles will form. To prevent scorching, be sure to stir the milk as it heats. 2. Mix together egg, sugar, flour and salt in a bowl and whisk well. Add slowly to milk, stirring constantly until thickened. 3. Remove from heat and add in the vanilla seeds and orange rind. Mix well, let cool and cover with cling wrap and put in the fridge for later use. Make sure the cling wrap just touching the custard so it doesn't form a skin. Scoop the chill custard cream into piping bag with big nozzle. Insert the nozzle into the cool cupcake and pipe out the cream as filling. Decorate the topping of cake with little cream. Finish off with other topping that you like. Keep inside fridge for few hours before serve. Enjoy! 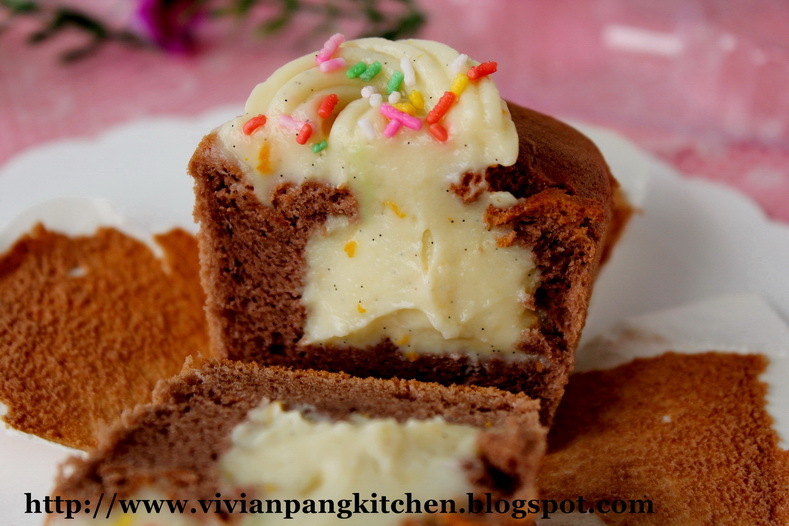 Lovely Hokkaido Chocolate chiffon cake with yummy custard cream. Your chiffon looks so soft!! 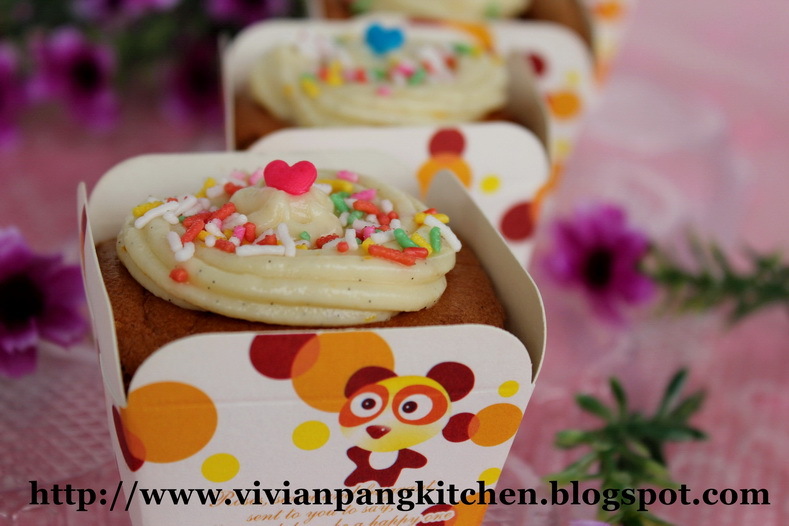 Hi Vivian, lovely cupcakes! I see your cakes didn't shrink at all, well done! 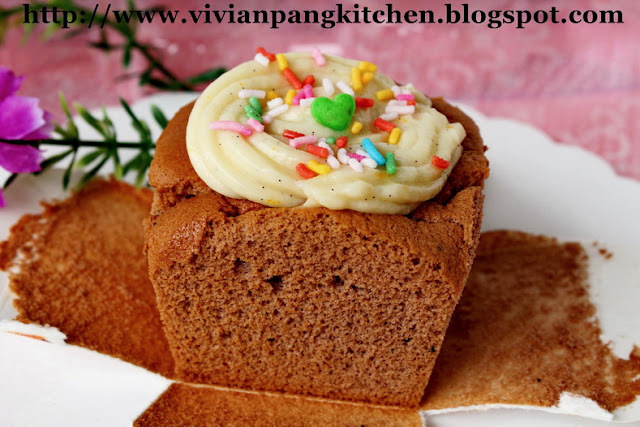 What is the purpose of rice flour in this recipe? Your cake casings are beautiful. I couldn't find any square casings in Melbourne. Too bad I don't have the photo without sprinkles. Next time will double check before I submit :) Thanks! yup, this custard cream is easy to follow and yummy. i think this is my first cocoa hokkaido cupcake i've come across, they are very lovely! Can i replace the vanilla pods with extract? Coz dun ave vanilla pods on hand. Wat is bain marie? Yes you can replace with vanilla extract. Bain marie is a method of cooking by placing the bowl of milk mixture(make sure heat proof bowl) on a pot of boiling water. The bottom of milk mixture bowl should not contact with the hot water. The heat of the boiling water do the cooking. In this way the milk mixture will not get burnt.